Tags: Banarsi, Double Layer, Formal, Wedding Outfit. Bright red pure crinkle chiffon anarkali frock. Frock has been adorned with embellished bodice and neckline. 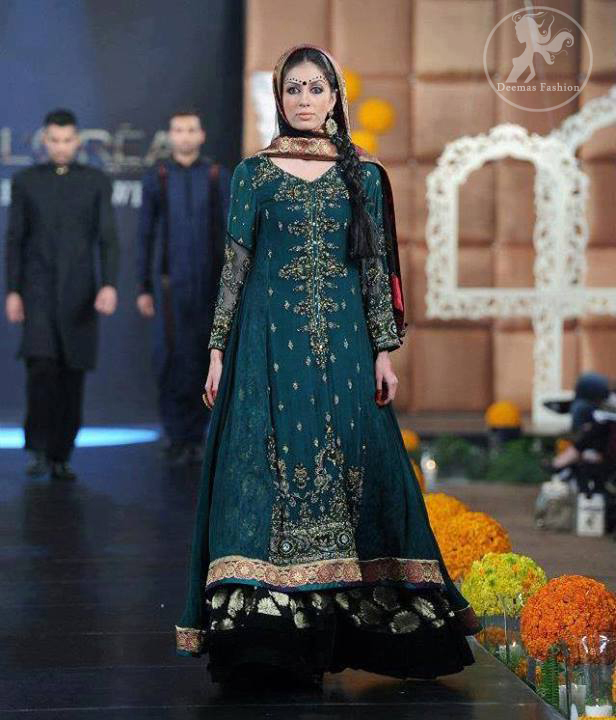 Embroidered borders with royal blue applique is implemented on hemline. Large embroidered motif pattern before hemline.. Under the bodice embellished lines move down to hemline all over the frock. Fully lined. Concealed with back zip closer. Pure chiffon dupatta. Dupatta is finished with banarsi piping. Bright red pure raw-silk churidar.